People are different! While some love nothing more than eggs and bacon in the morning, others can't face much more than a coffee-to-go. That's exactly why have decided to do away with the traditional buffet breakfast. Instead, guests can come to the Barception to purchase whatever they fancy. We always serve fresh Fair Trade coffee for you to enjoy in the lobby, take to your room or out on a walk! Visit our lobby shop and Barception to purchase a range of snacks including sandwiches and nuts, as well as alcoholic beverages including cocktails and locally brewed beers. In a rush? Come by and grab a coffee on your way out! We also sell breakfast bags and other yummy treats to get your day off to a great start. 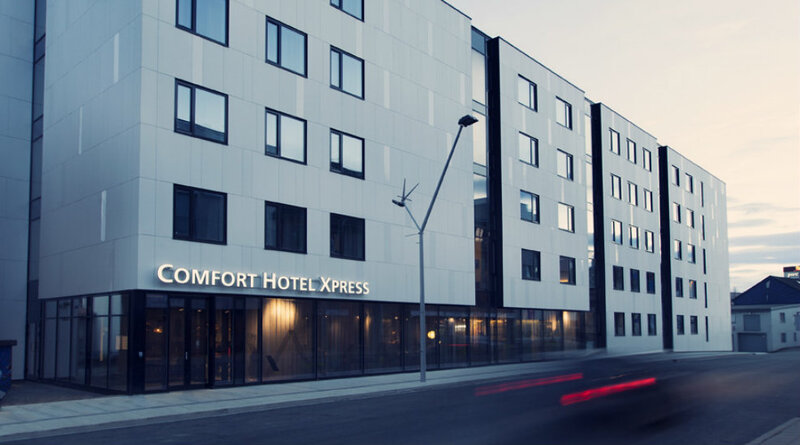 Everyone is welcome here at the Comfort Hotel Xpress Tromsø - dogs included! For just 250 NOK per stay, your dog is welcome to stay with you in your room (or most likely in your bed!!). Guide dogs can stay with you free of charge. Please do let us know if you would like to bring your pet at the time of booking so that we can reserve a suitable room for you. Avoid any queues with our self-service check-in stations and our Barception that is open all day, every day! The future is here to stay! We offer free WiFi access all over the hotel. Simply select the «Comfort Hotel» network and start surfing. No password, no hassle. Just the way we like it! If you come by car, we recommend that you park, for a fee, in a nearby parking garage.